A good lighting fixture store. Owner seems to be on premises all the time. There is a pretty good selection of fixtures in the store, the staff are quite helpful. They will order material for you out of the catalogs. Their prices are a little bit better than the catalog list prices. The folks at Nancy B’s were friendly and helpful, even though we arrived late in the day. 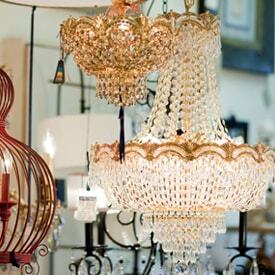 They assisted us in finding an attractive dining room chandelier at a great price. The light was boxed and ready for pickup the next day at the agreed time. They gave us names of installers they had used before, and I am happy with with the job that was done (Cole & Company Electrical). I have worked with Nancy for several years now and I can attest to the fact that she is extremely well-knowledged about all types of interior home lighting. She is dedicated to excellent customer service and takes the time to learn about your particular needs in order to provide the very best suggestions. 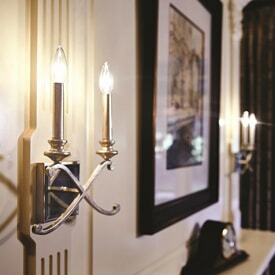 I could not recommend Nancy more to anyone interested in amazing and elegant lighting options!! Whenever I have a lighting problem, she is the first one I turn to. She usually finds a solution and is very helpful. Our custom builder recommended Nancy B’s House of Lights for extraordinary service and excellent products. We didn’t realize how daunting the entire lighting selection process would be. Nancy was knowledgeable and articulate, professional, always patient and positive. Her incredibly comprehensive website and “wish list” have been invaluable in our decisions. She has gone out of her way to provide catalogs and she even loaned an exterior light so that, on site, we could compare color variations in the sunlight next to the house. Thanks for all your hard work Nancy! Nancy, you can rest assured that we know who the LIGHTING GODDESS is. You have demonstrated outstanding service and competitive pricing, two things we practice in our business and something not found in abundance in this day and age. Nancy, thanks so much for coming out and a wonderful lunch. Your help is invaluable and I will highly recommend you to any and all. Please feel free to use me as a reference. Nancy Brewer has given me sound advice for years — sharing her knowledge generously. Now, in her own business, she excels. Nancy B’s House of Lights is an extremely valuable resource for my business. In the past we had to rely on catalogs to make our lighting selections. Now we can visit a beautiful showroom to see the actual quality and scale of the products. And as an added bonus, we can utilize the knowledgeable staff to help us do our job! Hi Nancy! The Regency Fan rep, was out to our home this morning and replaced the part in our bedroom fan that was not working and adjusted the antennae in our family room fan. All seems to be working when he left!! We enjoyed meeting Floyd and truly appreciated him coming out today! He is really great to work with! Thanks again for following up with him. - Linda Clatterbuck, Graystone Homes, Inc.
Professional and competent service is critical to builders as we work daily with suppliers. We appreicate the high level of services of Nancy B’s House of Lights. Light fixtures have always been a problem area because of the many details, but the service and competency that Nancy Brewer provides is second to none and virtually problem free. Any problems that do arise are quickly remedied with very little burden on us. It is a real pleasure to deal with Nancy of Nancy B’s House of Lights as indicated by many years of our working together. Nancy Brewer was very professional and helped me select all the lighting for my newly built home. She understood and respected my style and made some good suggestions that I had not previously considered. I would definitely recommend Nancy B’s House of Lights. Nancy Brewer and her wonderful lighting specialists at Nancy B’s House of Lights were absolutely essential when it was time to build my dream house. From blueprints to lighting selection and placement, their expertise and guidance helped make my dream a reality. I believe that lighting is truly the signature of a beautiful house, and they offer an incredibly wide selection, from modern to traditional. Mirrors, lamps, fountains and more, Nancy helped me find the perfect lights for my perfect new home. I highly recommend Nancy B’s House of Lights. As a designer and a customer, I’m a stickler for customer service. Nancy and her staff provide courteous, knowledgeable, and friendly service. 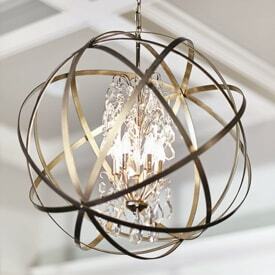 Additionally they go above and beyond to provide designers with the resources we need to assist our clients in finding the right lighting fixtures. I have worked with Nancy for several years now and I can attest to the fact that she is extremely knowledgeable about all types of interior home lighting. She is dedicated to excellent customer service and takes the time to learn about your particular needs in order to provide the very best suggestions. I could not recommend Nancy more to anyone interested in amazing and elegant lighting options!! Nancy was incredibly knowledgeable about ALL types of lighting for our fairly large custom home. She helped us understand the different types and spent a lot of time making sure our choices were just right and blended nicely throughout the house. She was creative, innovative, infinitely patient, and fun to work with! I highly recommend Nancy for any lighting needs. I cannot say enough good things about Nancy B. Her showroom is attractive and inviting and her lighting offerings seem limitless. She is all about quality products and great customer service. During the renovation of our 1949 house, she proved herself to be the Queen of creative solutions in difficult situations. Highly recommended. Nancy provides 1 to 1 service at excellent prices. She has a capable staff and plenty of inventory in her showroom as well as the latest catalogs for generating ideas. The quality of her products is well above the big box stores, and the prices are surprisingly competitive. Because she is local, returns are never a problem. I will continue to go to Nancy for all my lighting needs. Nancy and her staff are all very friendly, knowledgeable, professional and most of all patient. Her recommendations were all on point. We are very happy with our decision to work with her. I always go to Nancy B’s House of lights when I need to choose light pictures. I get wonderful personal attention and great prices. Nancy was a true professional in helping me with my lighting needs for my renovation project on the Charlottesville Downtown Mall. She knew where the lighting needed to be placed and the type of light fixtures to use in order for me to create the look we hoped to accomplish. She was very patient and easy to work with. Her prices were very competitive with anything available online. I would highly recommend Nancy B’s for your lighting and fixture needs. 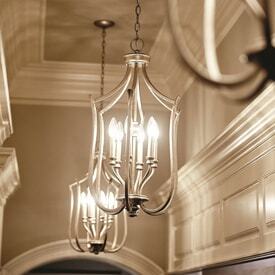 As the purchaser of lighting fixtures for Craig Builders, I have worked with Nancy since 2007. She and her employees are always willing to help solve any lighting problems a customer might have. We send our purchasers to Nancy for one-on-one attention. Nancy provides us with all the selections and pricing we need to allow our clients to pick custom lighting, and has worked with us to create the best packages at the best prices. We count on Nancy B’s House of Lights to check every resource for quality fixtures and service before and after the sale. Nancy B’s house of Lights has been the most reliable lighting vendor that we have worked with! The selection is amazing, the one on one service with our customers is top notch and deliveries are always on time! Thank you for continuing to help Jefferson Area Builder’s clients find affordable quality lighting for their new home! - Jefferson Area Builders, Inc.